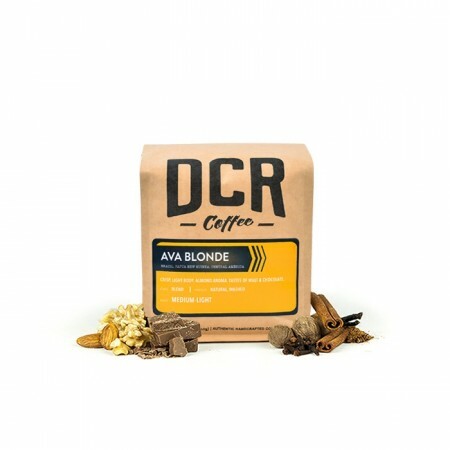 This is the Ava Blonde brought to you by Dillanos Coffee Roasters. Comprised of coffees throughout Central and South America, the roast profile highlights the unique qualities of the superb coffees that make up this blend. The Ava Blonde blend works great as an espresso blend or as a filter coffee, brewed as drip or French Press. We think this cup is well balanced, with notes of almond and chocolate. This was a relaxing roast; very balanced where no one flavor overtook the rest. It was always enjoyable any time of the day. Sorry, I thought I was commenting on the last coffee I received. I haven't actually tried this one yet. After trying it, I would give it 2 stars. This was my second favorite so far, after the Intelligentsia. It has a nice flavor but it doesn't taste bitter. This was one of my favorites in my shipments. Well balanced. I haven’t been really enjoying the picks based on my most recent profile so I changed it up a bit. I did enjoy the blonde blend and I’m looking forward to trying the single origin that’s on the way. Not crazy about this one, flavor profile was a bit muddy and a little more bitter than I like. A little too dark for my tastes. More earthy than I like. Not getting the cocoa notes. As a brewed coffee, very run-of-the mill “Starbucks” style coffee. It makes a descent espresso, but doesn’t knock it out of the park for me. Nothing exceptional about it. Loved that it wasn't too overpowering. Lacked body. Under roasted. No suitable for drip machines. Very good and smooth. Although I wish it had a more prounounced flavor. This was not blonde, but rather dark and one dimensional, lacking complexity. Wonderful light and sweet but not too sweet. I like it better than the last. I have been drinking it with non-dairy creamer for the Advent season..but will drink with milk (which is what I prefer) after Jan 7 at which time I will have a better idea of how much I like it. Would you be able to please send me this request again after Jan 7. And please hold off on sending another coffee until then? This is right up my alley. Very well balanced. Trying to finish this as fast as I can. Terrible tasting. Excellent coffee. They keep getting better! Loved this. Not as bold as the Atomic last week, but still good flavor. Decent, enjoyed in aero press & as espresso. It didn't have much aroma that I could pick up, though. I personally preferred (and my coworkers agreed) that the Atomic blend was a tad better than this one, perhaps because it had a more bold character, something a little more exciting. This is a great cup of coffee though in its own respect, muted, not too overpowering. I enjoyed both blends, though atomic a little more. Too much like Cafe Bustello. Maybe I ground too fine? I really enjoyed this blend. Not roasted too much and the tasting notes were fairly accurate. I wish it had a stringer body on top of which those testing notes could sit but it's certainly not lacking in that area. Overall a satisfying blend. I had to cut open this bag with scissors. You cannot, and I mean can not, be more than a degree over 205 with this coffee. Some notes of cinnamon, with a smooth, chocolaty finish. Even with my Chemex, this coffee has a good body and mouthfeel. A little oily, but not too heavy. My personal opinion, nothing to write home about. Bitter/burnt tasting. I've tried adjusting to improve the taste, but haven't had much luck. Not enjoying this one. I really enjoyed this one. I found some earthy notes, which was great, with just a hint of chocolate. It was a great mix. Very fresh and good crema, but acid and lacking in interest. Tasting notes didn't come through for me. This is awesome. The perfect balance of excellent flavor and drinkability. The roast is light, but the flavor is not. Its not powerful flavor but delicious subtle flavor that balances just right for a little cup of heaven every morning. I think this was my favorite. This is a light roast when my preference is medium. Really got the almond in this one, which was a fun new twist from the coffees I'd tried in the past. Also loved the walk on the lighter side as far as roast! I think I'm still a medium roast girl, but variety is the spice of life, right? I've tried making this coffee for a week now and just can't seem to get it right. Not sure what I'm doing wrong, but every time it tastes really burnt. Not happy at all with this one. This coffe bean was pretty good. I normally make lattes and cappuccinos so I will revise my preference to espresso roast. Used for espresso, great flavor, but not quite strong enough. This blend was not very good. Flat, Starbucks-y taste. This coffee has a good texture and color. The flavor falls a little flat black, but is great with a bit of cream. This one was definitely better than the previous. Good rich and complex flavors and was fairly forgiving in terms of shot timing. I think my only complaint would be that its acidity was pretty sharp for my tastes. I'd say this was an average coffee. Not worth $16 but not bad tasting. I enjoyed this blend a lot. I really enjoyed the roast level, it wasn't too dark and not too light, it was just right. The flavors were great as well. There were some earthy tones that I picked up on, most likely from the almond and chocolate. I brewed it in my french press and in my drip machine and it turned out great both ways! The coffee it's too light. Although I don't want French roast. Too bold for my taste - would prefer something lighter and less bitter. I love this coffee so much! I've been drinking it hot with vanilla almondmilk creamer and it is delicious! not bad, just somewhat of a bland taste that left me wanting something more flavor. This coffee does not have a roast date on the packaging. it says it's light roast but it's definitely a dark roast bean. This coffee seems stale and has a bad odor. Smooth and nutty. Great crema. Very good coffee. The roast is really burnt smelling and do not like that. I did not like the taste of this coffee. It is a little too strong and acidic. This blend is mild and not what I expected. Not bad. Just nothing noteworthy, really. Similar to my previous selections in terms of chocolatey, nutty, but for me, I'd like something with a little more of a pronounced flavor that would set it apart from the pack. After drinking the Atomic Blend Ava Blonde Blend seemed average. While the smell was nice and it was smooth and not to acidic, the flavor was not bold, unremarkable and not to different from beans you can get at the grocery store. Prefer the smell, Blend, and unique taste of atomic Blend to Ava Blonde. Great coffee. Brewed using a v60 pour over and used in Saeco Intellia espresso machine with a splash of 170 degree water. Great balance and notes came out well with both methods. Tried with a chemex and as an espresso blend. This blend seemed to have a higher acidity level than we usually drink. Okay when brewed by a mocha pot. Not overly earthy nor overly bright - should I say lack of surprise too? I will try to brew by French Press tomorrow and may come back and edit my review. Just had my first cup and I am already looking forward to my next cup. The nutty taste and full body worked really well for my cup of cappuccino. I enjoyed this cup. Although, for me it was not all that flavorful. I could really taste the chocolate notes, but I would prefer a "brighter" cup of coffee next time. This has been the best one yet. My tastes are certainly evolving and I got all the flavor notes out of this one. A nice nutty blend with a smooth chocolate finish just like its printed on the bag. The after taste was so nice and smooth. It was a tad light and it was interesting how the bean aromas were not as strong as I usually like them, but the flavors certainly made up for it. Really excellent. Exactly what I look for in a coffee. Like the richness and deep flavor. Good, but maybe a bit too subtle. I don't like chocolate flavored coffee. I like Jamaica Blue Mountain and Hawaiian Coffees. I also do not like to buy my coffee from certain places because of political policies that the countries may have. It there a way to see what you want to send me before it gets picked? I am a chocolate lover and this coffee hit my taste for that perfectly! Really good flavor for a light roast! Really enjoy it although I might like a little richer blend for my next offering. Thanks! It was a lighter roast than what I normally drink, but the chocolate notes were particularly enjoyable! We enjoyed the flavor of this coffee, however we felt that this was more of a medium/dark roast than a light roast. We are primarily brewing our coffee with the Chemex method. We enjoy a more full-bodied coffee, but we would like to start trying single-origin coffees to determine what variety of beans we prefer. the flavor was to weak for us. Nutty and chocolate is okay, but roast is too blonde; I prefer stronger, dark roast. Based on the description, I thought I would love this, but there was a distinct tobacco-like flavor and a bitter acidity that overwhelmed my palette a bit. I enjoyed this, but it's definitely not something I would go out of my way to find. Really disappointed in this one. I don't remember too much of this coffee but I remember enjoying the taste and aroma. Smooth and satisfying. I definitely taste the chocolate. Lighter than I normally choose, but instead of being weak and leaving me wanting something more it was crisp and refreshing. Like a breath of fresh air. I'd buy this again. Very good coffee, kinda generic tasting. Not so different then the store bought I've been using! I would not consider this a light roast. I'd say it's dark if anything. Reminiscent of a Starbucks or any of the other large, over roasted, tasteless coffees. I couldn't pick out any tasting notes from the burnt, chalky taste. I had an allergic reaction to this one and had to throw out. Very dark for a "blonde" roast. Not a lot of flavor, not interesting in flavor profile at all. Ok as far as 'blondes' go, I would put it more toward the 'balance' side of things. Nothing outrageous flavor profile wise. I mixed it with coffee I actually like to finish the bag. Did not like this coffee. Tastes more like tea than coffee. I noticed floral, not nuts or chocolate. This coffee was really nice. Had a mellow approach to the palate. I quite enjoyed this one. a bit light and acidic for my liking. I do not know enough about coffees to give an "Anthony Bourdain" - esque review but I made it in a Mr. Coffee type coffeemaker and not my Chemex as I usually do (out of laziness) and it was still really great! I will make it out of the Chemex next go around and hopefully give you a more accurate review. I am a sucker for good packaging/design though, I know that makes mes sound superficial (which it is) but if you could tailor future coffees to that that would be great! * also for the sake of variety could I get a coffee from Africa or Asia just to compare? This one's tasty. Makes me happy. I'm in a silly mood. That's the end. The coffee was very good, but a little weak. I love the rich, nutty taste, but also want to venture out. I look forward to the next box and it's history/location. Loved this coffee! It was perfect black (the way my husband drinks it) and perfect for almond milk and sugar (the way I drink it). Thank you Conner and Samantha! Didn't really care for it. Boring cup. I wouldn't say that this is necessarily bad coffee, the taste is there - just not the type of coffee we prefer. It's not a bad morning cup but we like something a little fuller.